In 1972, Larsen was invited by The Thai Silk Company to design a collection in tribute to their founder, Jim Thompson. Architect, CIA agent, silk entrepreneur and avid Asian art collector, Thompson had launched The Thai Silk Company in Bankok in 1948 and become an authority in the industry, earning the nickname “the Silk King of Thailand,” for his efforts to revive the prestige of this local craft. Thompson mysteriously vanished while vacationing in the Malaysian jungle in 1967. Thompson’s one-of-a-kind Thai-style house in Bangkok has now been turned into a museum, allowing the visitors to delve into his rich history and to admire his extensive collection of Asian antique treasures. Larsen, who had first designed for Thai Silk in 1951, ended up purchasing the company, and An Homage to Jim Thompson was the first collection produced under Larsen’s leadership. Naturally, he brought something new to the company: he introduced the technique of Southeast Asian weft ikat, or mud mee. His bold design for Laotian Ikat was originally a collage of torn paper, and the ikat technique beautifully replicates the feathered effect of the torn edges. Inspired by the traditional Lao-Tai sinh (skirt), Larsen brought an instant modernity by playing with scale and geometry. He borrowed the typical combination of solid-colored and ikat-dyed narrow bands, and used it as an effective graphic counterpoint to the oversized orange diamond shapes. In the ikat process, yarns are tied and dyed according to a specific pattern before the weaving process; slight misalignments during the weaving give it its characteristic blurred effect. Larsen worked closely with the Thai craftsmen to produce a heavier and wider fabric woven in continuous lengths to suit the interiors market. Magali An Berthon was a Peter Krueger Summer Intern in the Textiles Department in 2015. 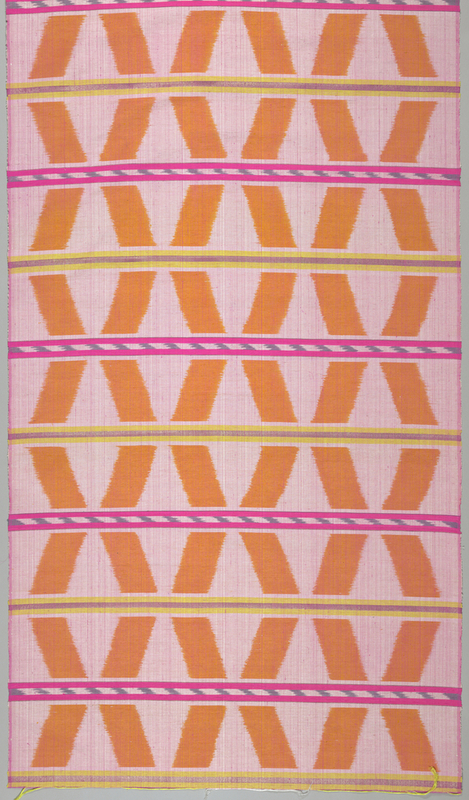 Textile, Laotian Ikat, 1972. silk, metallic gimp. Gift of Jack Lenor Larsen. 1973-54-7.